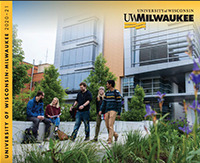 UWM offers programs for students interested in taking courses for college credit. To learn more about programs, admission processes, and deadlines, visit UWM’s Concurrent Enrollment page. Students must have a 3.5 GPA in their desired area of study and/or overall GPA. Students who are near this requirement may still be admitted with departmental approval. Students must be on track to meet UWM’s admission guidelines in regards to course completion. Join us on the UWM campus for a behind the scenes look into the creative process of dance including a performance by the UWM Dance Department, a Q&A session with choreographers and performers, and workshops designed to showcase life as a dance student. Interested in learning about a day in the life of UWM dance majors? Join us for a Technique class with first year majors to discover what it’s all about! A one-week, immersive workshop provided by our MFA candidates and internationally acclaimed Dance Faculty where high-school students will participate in daily classes specially designed for their technical levels. Preview bodies of work from undergraduate seniors, and get to know current students and faculty. This bi-annual festival, hosted at our award-winning Union Cinema, shows work from the current semester’s graduating class. Preview bodies of work from undergraduate students, and get to know current students and faculty at this bi-annual festival hosted by our award-winning Union Cinema. Award reception will follow the screening. A comprehensive animation experience including workshops on Storytelling/Storyboarding, Drawn Animation and Editing/Post-Production throughout a series of hands-on studio time led by our department instructors. A comprehensive film production day camp which includes workshops on Storytelling & Screenwriting, Cinematography & Lighting, and Post Production & Editing throughout a week-long series of hands-on studio and lab activities led by UW-Milwaukee Faculty & Staff. Limited enrollment available to rising 9–12 graders. Hosted by the student organization Horn Club, Middle and High School students are invited to attend masterclasses and workshops with Associate Professor of Horn, Greg Flint and students from the UW-Milwaukee horn studio. Horn players will also have the opportunity to play in a large horn choir and perform a concert at the end of the event. In addition to playing horn-specific repertoire, students will also learn about proper techniques, horn history, maintenance, and career opportunities. Brass Day is open to four rotating High School Band brass sections to rehearse and perform traditional and contemporary brass repertoire alongside UWM music majors. Led by UWM brass faculty, participants are invited to join their respective high- and low-end colleagues for a day of rehearsals, clinics, and ensemble performances. Unfortunately this event has been CANCELLED for this year. Please check back for updates on next year’s Jazz Fest. This festival provides the region’s top middle school instrumentalists an opportunity to work with each other and with nationally recognized wind band conductors. In addition, students participate in master classes with the UWM Department of Music’s performance faculty, and they hear performances by UWM ensembles. Milwaukee Music Festival High School Honor Band with Frank Ticheli! The annual Milwaukee Music Festival (MMF) High School Honor Band returns in November with internationally renowned composer Frank Ticheli as our guest conductor! Mr. Ticheli’s music for concert band is well known throughout the world and many of his works have become standards in the repertoire. MMF brings together an ensemble of gifted and like-minded high school musicians from Wisconsin and surrounding states for a weekend of rehearsals, master classes, and performances with UW-Milwaukee (UWM) students, faculty and guest artists (including members of the Milwaukee Symphony Orchestra) at UWM’s Helene Zelazo Center for the Performing Arts. Under the direction of Dr. Jun Kim, Director of Orchestral Activities at UW-Milwaukee (UWM), participants of the Milwaukee Strings Festival for Young Artists will join gifted and like-minded high school string players from Wisconsin and surrounding states for a weekend of rehearsals, master classes, and performances with UWM students, faculty, and guest artists. Open to all students in grades 7-12 who identify as male. No advance preparation necessary. Students will break into a 7th-8th and a 9th-12th grade choir. The event will conclude with performances from both ensembles as well as the UWM Men’s Chorus! Collaborating with the UWM Department of Music, the String Academy of Wisconsin (SAW) offers students between the ages of 4 and 18 a comprehensive musical education with a focus on the violin, viola or cello. Our Pre-College Guitar Programs offer comprehensive guitar and music instruction for children and teens of all skill levels aged 5-18. Through lessons and performance opportunities, students gain a solid foundation in classical guitar, equipping them with the basic skills required to be versatile in any style. Open to all treble voices in grades 7-12! No advance preparation necessary. Singers will break into a 7th-8th and a 9th-12th grade choir. The event will conclude with performances from both ensembles! An opportunity for talented high school singers to interact with, perform for, and join their voices with peers from around the region. Participating students will have the chance to learn and grow as both soloists and choral artists. The Milwaukee Youth Horn Choir provides the unique opportunity for young and talented horn players to explore the art of music making and horn playing on the UW-Milwaukee campus with the Associate Professor of Horn, Greg Flint. Participants will be placed into chamber ensembles, where they will rehearse music that is specific to the horn and perform a concert at the end of the eight week rehearsal cycle. In addition, horn players will learn about proper playing technique, tips for excellent intonation & rhythm, and general ideas about rehearsal etiquette. The UWM Youth Jazz Ensemble is an audition youth group featuring high school students from all over the Greater Milwaukee Area. The group provides the experience of being in a professional-style jazz ensemble, including instruction from UWM instructor and saxophonist Rosemary Walzer, as well as numerous performing opportunities. UWAY provides the regions finest woodwind, brass, and percussion students the opportunity to rehearse and perform the best of traditional and contemporary repertoire in an artistic environment with other likeminded musicians. Students are led by artist-faculty from UW-Milwaukee, and work closely with other musical members of the university community. Attend a free vocal and/or monologue coaching session! Take advantage of this opportunity to connect personally with faculty while learning more about what it takes to have a successful collegiate audition. To reserve your spot email your name to theatre-admission@uwm.edu.